In her third cookbook Silvia embraces the Mediterranean food she grew up with, taking us far beyond the heavy pasta dishes and rich cakes that Italian cuisine is often (mistakenly) associated with. Italian home cooks are more likely to cook simply, allowing fresh fruit and vegetables, legumes and fish to shine, with sparing use of dairy, meat, animal fats and sugars. Try this fresh recipe from Silvia Colloca’s La Dolce Vita. Silvia Colloca outlines why these three little words mean so much. 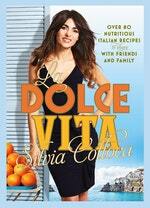 Love La Dolce Vita? Subscribe to Read More to find out about similar books.